Both Mr. Harris and I were asked to respond to a question from the floor about what we were doing to advance the multi-centre proposal. In Mr. Harris’ initial answer he spoke about the lack of a specific “program” that would enable him to try and secure Federal dollars for the $30 million initiative. He also explained that the province generally takes the lead role in determining what projects get funded. I stated I had no issue with Mr. Harris’ accurate reflection of how the current one-third arrangement works and the critical role the province plays, but pointed out that it is the “program” approach to funding community projects that is the problem. Why do we have to wait for “senior” levels of government to design a program that we must then adapt our needs to in order to get our tax money back? Why can’t we simply get projects funded that meet our needs based on a good business case and proposal? I also restated my argument that we should get more fully funded projects in our region – just like Vancouver got a fully funded convention centre and a new roof over BC place. Mr. Harris’ response was that the Federal government couldn’t fund $10 million here without a program — because lots of other communities would want the same and suddenly the Federal government would be spending a billion dollars on community projects all over Canada. But, he presented this argument as if spending a billion on community projects would be fiscally irresponsible — that’s what got my dander up! I pointed out that I felt it was fiscally irresponsible to spend $1.2 billion plus on the G8/G20 summits. Rather than a fake lake and over-the-top security for politicians to wring their hands about the sorry state of the global economy (mostly as a result of their poor leadership I might add) I’d sooner see that billion dollars go to community projects all over Canada, especially rural Canada! The priorities of both the Federal and Provincial governments are skewed to urban, global and corporate interests to the detriment of taxpayers and rural communities. It’s time they stopped spending money on mega-projects and photo ops and started focusing on good public services and community development – which is what we pay taxes for in the first place. Reprinted with permission from Bob Simpson’s blog. 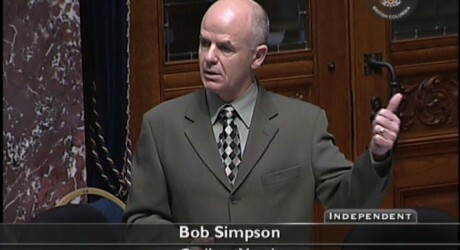 Bob Simpson was re-elected as the MLA for Cariboo North on May 12, 2009. He was first elected to the Legislature in 2005. ← Bob Simpson MLA: Does BC Still Have a Climate Change Agenda?